Venue: The Kashmiri Overseas Association Camp at Turf Valley Resort in Maryland, U.S.A. There are about 500 people in attendance and a main highlight is to be a performance by the renowned Kashmiri singer-musician Dhananjay Kaul. On the day of the performance, some youngsters are playing in the large pool and there is a person swimming laps. There is nothing uncommon about the scene, but the person’s long locks draw attention and the fact that he has been swimming continuously for a long time. Cut to the evening: The person with the long locks of hair is in traditional Indian attire and is on stage. No prizes for guessing that he is Dhananjay Kaul, the highlight of the camp. The youngsters talk to each other in amazement if not bewilderment. Here is a Kashmiri singer who beats stereotypes. If you know Dhananjay, you know that it is hard to box him. He is many things, of many abilities, has varied interests and hence, even his music is diverse. If you do not know him, you want to know him. I am glad that I got to spend time with him and speak with him at length so that I can let you know what I know about him. Such a man you may think has an exotic background. Guess what? You are right. He is the grandson of Pandit Shambhu Nath Kaul, a Jagirdar who had a huge tract of land by the banks of the famous Manasbal lake. His father Pandit Shanti Chaitanya Kaul was the youngest of 3 brothers and quite pampered. He would ride to school on his horse and had a grown-up mind early. At 13-14 years of age, he left home to become a sanyasi (took renunciation). He only returned to family and home when he was 28-29 years old. That is when he also got married and entered Grihastha. He carried though some regret for leaving his spiritual pursuits unfulfilled. Dhananjay was widely influenced by his father who was a handsome man with unique looks. Dhananjay got into music early as his father had. In fact, music is deep-rooted in the family. Dhananjay’s grandmother would also sing and his great-grandfather would host Sufiyana Mehfils (musical get-togethers) at home. Dhananjay remembers listening to Surdas and MiraBhai Bhajans and also Sufi Kalam from his grandmother. Dhananjay took from his early influences and learning at home to venture on a journey of his own. Actually, he undertook many journeys, to get to where he is now. He is an accomplished singer and musician who has mastery of his subject; Is a performer par-excellence and can compose and sing diverse musical forms in several languages. He is now taking added roles as an ambassador of Kashmiri and other Indian folk and classical music and as a mentor to budding artists. He would not be who he is however, if he did not journey as he has. Dhananjay was a prodigy of sorts from the very beginning. He was easily the best singer in his school and would be called out a lot for that. This was without any formal training. He then learnt the Ragas from his father but the passion for music was his own. Even when others would roam in the town or find other interests, Dhananjay would immerse himself into music for 4-5 hours, looking out towards the orchard from the upper-storeys of his home. He would then retire downstairs and practice even more. Dhananjay believes that his voice is inherited from his father. He did not like it initially, particularly its texture. However he was coached in the Thumri Ang of Gayaki (where one’s true voice has to come out) and over time realized his own potential. Others never had doubt and hence he first performed on stage when he was only 9 years old and qualified a major radio audition (All India Radio) when he was only 12. At 14-15 years of age he got Swar Gyan (Learnt Notation). Nirmala Arun ji (filmstarGovinda’s mother) contributed considerably towards Dhananjay’s formal learning of music. He then learnt the tabla from Ustad Hashmat Ali Khan for about 2 years. That may be a reason why he is very picky about his tabla accompanists. As a traveling musician without a formal troupe with him always, he is sometimes required to make do, which he unspokenly has a hard time accepting. He would love to find the same level of perfection in his accompanists, sound systems and audience engagement as he puts into his practice and performance. I have heard this about several other artists who believe that music is not to be treated in a make-do manner. Be whatever, when audiences settle in to listen to Dhananjay in a concert, he holds them in thrall. Much of this comes from the learning acquired by him during his formative years and the rigor and discipline practiced by him from early. In 1989-90, when Dhananjay was only 19, he was asked by Pandit Bhajan Sopori to reach Delhi for some work. Srinagar was under curfew and Kashmir was burning, but the young Dhananjay managed. He sang 3-4 songs and earned a princely sum of Rs. 5000. He believed that it was going to be a great ride from there and stayed on. Bhajanji was a huge mentor and Dhananjay rates him very high as a musical genius. Bhajan Soporiji has created great compositions, bringing Ragas into Kashmiri Ghazals. However the next assignments were not lining up for Dhananjay. So, he sang in hotel groups, keeping the flame for learning and advancement lit. Although Dhananjay had interactions and learning experiences with the likes of Pandit Bhimsen Joshi and Gulshan Kumar, it was not really sustainable to stay, and hence after 3-4 months, Dhananjay returned in the January of 1990. Not to Kashmir but based on advice, to Jammu. His dad was still in Kashmir despite being on the hit-lists of militants. Those were trying times. The visuals and situation at Geeta Bhawan, of many Kashmiri Hindu displaced people, shocked his young mind. He temporarily stayed with an uncle of his who had been a professor at Gandhi College. But his father would not leave Kashmir and so some time after this arrangement, Dhananjay contacted Shakti Maharaj in Udhaywala. It took an IED blast that destroyed a portion of his home in Kashmir for Dhananjay’s father to leave Kashmir. After some struggles, the family received Government accommodation in Jammu. But this could not be the final destination of a young talent. So, it was going to be Delhi again. However, one could not thrive commercially in Delhi with Kashmiri singing. So Dhananjay learnt Urdu from his father and also put a lot of effort in learning Saraiki and Multani. He could now sing for non-Kashmiri audiences also, the words of Shah Darvesh and Bulle Shah. Dhananjay thanks Ranjeet Kaur and Prof. Manjeet Indra in Chandigarh for their vital help and guidance at this stage. Certainly the challenges were not easy but the young Dhananjay had proven to be an able match. The learning acquired by him in those tough times holds steady when he sings a range of Punjabi, Sufi and Urdu language compositions effortlessly and naturally. He is truly exceptional in this genre. His learning was the cause of his growth. Dhananjay was getting work and recognition. He shared stage with the likes of Pandit Bhimsen Joshi in a 1995 concert and a concert was organized in his name at Abhinav theater in 1997. Even with all these developments, he only remained on the path to success and could not claim that he had arrived. So, he was constantly finding ways of improvement and acquiring new skills and making new creations. Meanwhile something important was destined for Dhananjay. Could it be what an astrologer had predicted about Dhananjay was to come true? In the village where he was born, his was one of only 4-5 Hindu families. Quite early it had been predicted that Dhananjay would attach emotionally and given the situation, he consciously worked to keep balance in his relationships. But who is to stop destiny eventually, or the work of Cupid. In 1999, he first met Anjali who had come to Delhi to study. She was to be a performer in Dhananjay’s father’s group, the Pari Mahal Opera. As predicted he got attached emotionally and their travels together for work fast-tracked the relationship. Dhananjay and Anjali got married and in 2003, they had their child Savar. Dhananjay loves kids and he considers Savar as his biggest gift from life. Even with so many happenings and changes around life, there have been some constants for Dhananjay. Fitness is a passion for him. He will do his work and then work-out. He swims, does Yoga, breathing exercises, running and when possible, free weights. He believes that good health helps in improved performance, and who would disagree. There has been another constant in Dhananjay’s life and it is his love for nature; the open and the hills. He often goes to Uttarakhand for time to himself. He walks into the hills and sings with gay abandon. He believes that this time away from the mundane really helps him to grow and discover self. Dhananjay considers Swami Sachitanand Ji Maharaj to be his spiritual Guru and strength. His such traits must be what made him dear to the preacher Morari Bapu. Once he was called to sing with Morari Bapu in audience. Morari Bapu listened to him for 8 straight hours and Dhananjay too had kept singing on request. This is a relationship of faith which has endured. Dhananjay was asked to perform live on TV (Aastha Channel) in 2004, so well liked was his singing by Morari Bapu. Dhananjay has wise and knowledgeable words about many forms of music. He believes strongly in the potential for the outreach of Kashmiri music. While Garhwali and much of the music in the entire Himalayan belt is sung in 2 main Ragas, Kashmiri songs are found in 40 or more. In 8th-9th century, during the times of Abhinavgupta, Kashmir used to host music conferences. There is abundance of Kashmiri poetry; devotional, Sufi and other, that can be put to music. The writings of Lalleshwari, Zinda Kaul, Krishan Joo Razdan with influence of Sanskrit as well as the words of Derveshes (Muslim Saints) and the likes of Ahad Zargar with influence of Persian or Arabic words, beckon composers and singers. Then there is Krishnakar Ji who has written Bhajans in Persian. His works are yet to reach the wide world and it is one of the aims of Dhananjay to do that. He wants to take this as a major translation and singing project. Kaafi, Jaijaiwanti, Bilawal have become part of Kashmir folk. An example of their use is in Chakkri. Bambro-Bambro and Rind-Poshmal have been effortlessly adopted into film songs. While Sufiyana Mousiki has Mukams, we have ragas in Indian Classical. Kashmiri songs that are Raga based are popular, as are Urdu and Punjabi language Sufi compositions. So Dhananjay feels that notes-swaras should be appealing, whether the singing is in Kashmiri or a non-Kashmiri language. At some point language becomes secondary and the need is to introduce new elements into compositions and singing. Dhananjay believes that while Vishal Bhardwaj has used Kashmiri in Haider, it could have been better done. He does like that Shraddha Kapoor has sung a full Kashmiri song in tune and raga. He believes that Dina Nath Nadim’s Myen Chem Aash Paghich can be done beautifully. Vaakhs, to Sufi Kalams and even fresh Kashmiri lyrics need to find exposure. 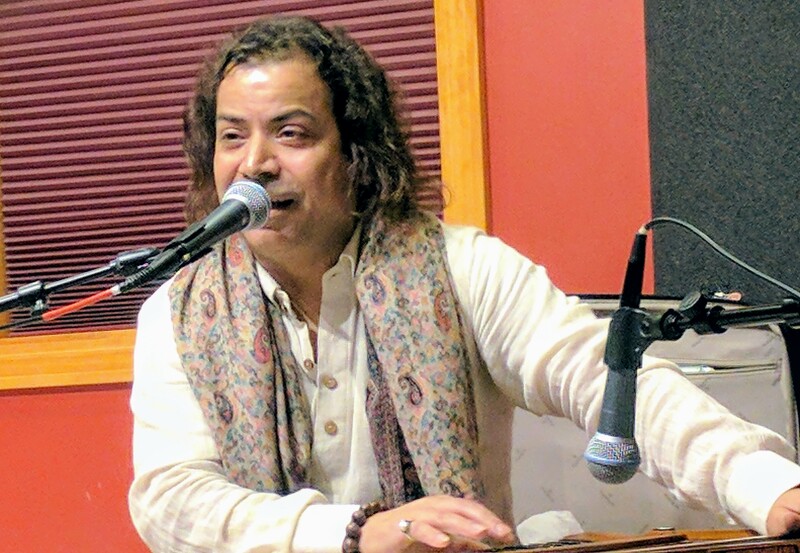 Dhananjay can cater to many music tastes and his visit to Pakistan, where he spent a fair amount of time in the company of the likes of Ustad Hussein Baksh Gullu helped him. In fact Dhananjay considers Ustad Hussein Baksh to be his Roohani Guru. The gayaki (singing) of Bade Ghulam Ali Khan, Barkat Ali Khan, Ustad Salamat Ali, Fateh Ali Khan and Amanat Ali has also influenced him as he has gone about creating his own style. Dhananjay would love to take on international compositions and is looking to travel more and meet international singers and composers for inspiration and collaboration. Dhananjay is now an ambassador for Indian music internationally. Every time he talks to audiences and musicians, he is able to convince them about the need to incorporate the values, principles and functional exercises of Indian Classical music. 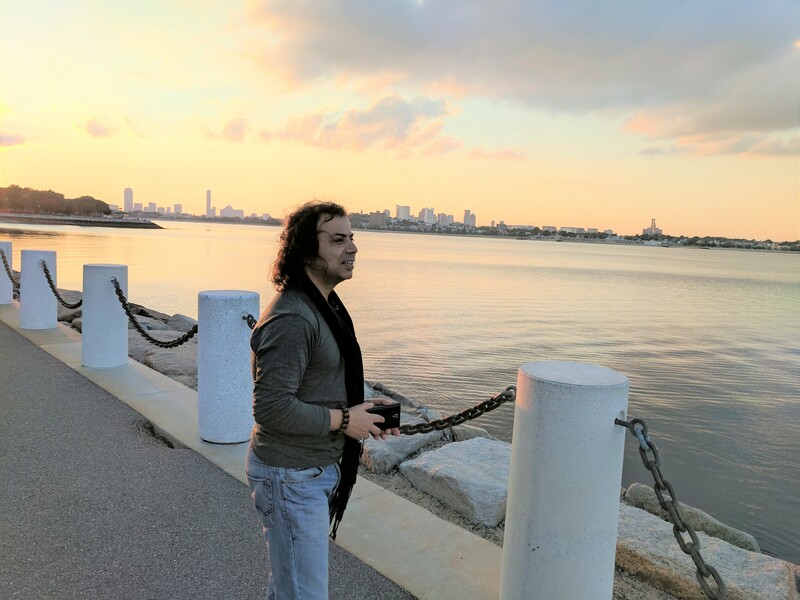 He met Shyan Koul, a young music lover in Boston who requested Dhananjay to provide similar opportunities to other musicians through his Workshops in Music Foundation. Formal programs and schedules are being worked out and this is certainly something to look forward to during 2018, for musicians and aspiring ones. It is as interesting to listen to Dhananjay talk about music as it is to hear him sing. He is extremely knowledgeable about the subject and hence his role as a champion of Indian Classical would be greatly helpful to the comunity of global music lovers and performers. Dhananjay indeed has rare skills and experience, which give him a prime position among singers and musicians from Kashmir. He has already done a lot in showcasing Kashmir as a musical powerhouse. Through future collaboration and initiatives, his legacy as a creative and versatile Kashmiri musician will be globally cemented. Wonderful videos. This writeup gives insight into what makes an artist of the caliber of Dhananjay Kaul ji. Excellent overall. Congrats to Dhananjay. It is recognition due.